We copied a parts of a discussion from facebook here for record. Here is an explanation from my perspective in the Chen style Taijiquan Practical Method lineage of Hong Junsheng. None of this explanation is to put down other Chen style lineages, only to explain why we are different. My Shifu, Chen Zhonghua is performing Yi Lu as he learned it from Shigung Hong Junsheng. All his moves come from Hong Junsheng’s teachings. Hong Junsheng was one of Chen Fake’s first students in Beijing in the 1930s. Hong studied uninterrupted with Chen Fake for 15 years until he moved to Jinan during WWII. Hong taught in Jinan until he came back for 4 months of final corrections from Chen Fake in 1956. Hong also taught that when he learned from Chen Fake there was no shifting of the center to the right, left, backward or forward. “An axis of a wheel can only rotate, not shift” according to Hong’s writings from his interpretation of the classics. Therefore, the center in a same posture always remains in the center and you can power up with either leg. You only shift the center when taking a step. When you shift the center in that case, you do it without moving the spine side to side, but by just opening and sitting on that kua and the opposite leg will then be light in order to move it. When you finish taking the step, the datien returns to the center. In terms of Shifu’s energy “not seeming to come from the lower body”, a characteristic of an internal martial art is that advanced movements cannot be seen by onlooker. In other words, his lower body is doing joint rotations, no movements (other than rotation which we define as not really a “move”). If you were taking one of our workshops, this question he would answer it by letting you feel his kua while he does the posture. There you will actually feel that his joints are rotating in place instead of moving and therefore the posture’s force does not leak out. It comes from the opposite foot, transmitted by the kua and out through the hand or wherever the contact point is with the opponent. I suggest you read Chen style Taijiquan Practical Method Volume 1 by Hong Junsheng and translated by Shifu Chen Zhonghua if you are interested in further reading about our perspective on Chen style Taijiquan. Thank you so much, Shifu. @ Erik: His first DanBian (0.22) is essentially that of Chen XiaoJia (arms quite spread (> 120º), yet not fully; weight distribution rather 60/40 than 70/30; the later is the usual in Yan g style. In Yang the arms are less spread (≤ 120º). These rules are from Tung-style Yang, as learnt from master Tung KaiYing. @ Xavier: Very illuminating analysis of the horse stance!… How would you extend these considerations to the Chen cross-legged crouch? In answering Erik’s and Oscar’s post, I again say that I am just explaining the way our lineage does Chen style Taijiquan. I am not putting anybody down or saying they are wrong. We are just different. Erik, Another of Hong Junsheng´s innovations to the Chen style happened in 1956 during the 4 months of final corrections with Chen Fake, shortly before the latter passed away. Chen Fake reviewed every single move of Yi Lu and Er Lu with Hong and explained each and every posture’s martial application. Hong noticed that the way the application was done was different from the way it is performed in the form. In Traditional Chinese Martial Arts this is known as separation of Gong (skill) and Fa (method). Hong asked Chen Fake why it was taught that way. Chen Fake did not know and he told Hong “that is the way my father taught me”. Hong then asked for Chen Fake’s permission to perform and teach the forms in the exact way that the martial applications are performed. Chen Fake said he saw no reason why not and told Hong “not to worry too much on the external appearance of the form, but to concentrate on the principles”. 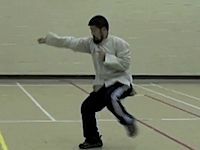 Hong Junsheng from that point on taught and practiced his form exactly as you would perform the martial applications of Chen style Taijiquan. Chen Fake was going to continue to help Hong with that development, but he passed away shortly after their final meeting in Beijing in 1956. Also with that background of performing the form the same way as you use it in combat, in terms of the “fixing the hips” , in our lineage we maintain a central equilibrium at all times. We do not shift left, right, forward or backward. We only rotate in place to create the effect of a spinning wheel. If you touch a tire that is spinning your hand will be thrown out. That is exactly what we want to happen to our opponents immediately upon contact. So, yes, it is a deliberate thing to maintain central equilibrium when in the same posture unless you are taking a step. The only other exception is “Golden rooster stands on one leg” posture and kicking. Oscar, that is a very good question. I will try my best to answer it from my limited knowledge at my current level. A crossed stance (in our lineage) is usually performed by spinning from a horse stance, bow stance or empty stance into the cross stance. Once in the cross stance you either spin back to the former stance, take a step or kick. While spinning into the cross stance we maintain central equilibrium. When taking a step or kicking, we shift the center to leg that will be supporting us. That shift, again, is performed by sitting and opening the kua (ball joint part of the femur bone) of that leg and never shift the spine side to side. Once we kick or take the step and land we return to central equilibrium immediately. Your statement of a 60/40 distribution is close to what we do. In Hong’s book he explains that the ratio of the feet in each stance while maintaining central equilibrium is 40% on the empty foot (not issuing power), 50% on the solid foot (issuing power), and save 10% for the waist to be used to coordinate while changing the ratio of the power of the feet. The power is changed by rotation of the joints while keeping the dantien (center of the body) in central equilibrium. The requirement of one foot solid and one empty is that in those proportions one is lighter than the other, but it is NOT (grandmaster Hong’s emphasis in his book) 100%/0 distribution and shifting the center side to side, or forward and back. I also recommend that you read Hong Junsheng´s book that I mentioned in my previous post if you want to go deeper into Hong’s teachings and his contributions to the development of Chen style Taijiquan. Hope this answers your question. 1. At a higher level, power cannot be seen. 2. Movements that can produce power cannot be seen. 3. Power must come from the ground, or whatever that have the property similar to the ground. 4. The body only acts as a conduit. It should provide a structure, a point of reference, or an aiming devise. The body should not be part of the power. It should no contain power. 5. Taiji is the art of making the opponent fight the ground, or something stronger than the taiji practitioner. 6. Whatever we want to do, it will appear to be the opposite. For example, we want to use the waist but in taiji movements, the waist should not move or turn too much. We want the hand to be strong but we cannot move the hand. I’ve seen that yilu, and will watch that one. Some clarification please. So my muscles, or my body is changing to where I can understand that to release (not relaxing, but can resemble relaxing to an outside observer) is not to catch force in our muscles as part of this method or to catch it at will, where and when you want depending on what we are attempting to do. I am finding it difficult to activate certain muscle groups? Is this a result of my practice and what you refer to when you say it took you 7 years to become strong? Maybe there are different ways to describe this, and everyone has a different perspective. Catching force and trapping it or manipulating/transferring it is a stationary action either muscular or not. This could be described as one type of power, but so could creating a center and hiding it as in not moving a point just as a buildings stationary existance is powerful but does not have an action in and unto itself. So as I am understanding at this point in my training, the power in Tai Chi is just maintaining a center and either adding space, or subtracting space between it and our opponent. By remove the space and capitalizing on the position, they fall down and we only adjust our bodies structure to facilitate this. As I am understanding, it is a higher skill level to maintain a center higher up in the body or closer to the opponents point of force, that is why we train the foot first because of the space involved which essentially equals more time to react which would be more important at a lesser skill level before we truly understand how to deal with force, especially abruptly issued force? Sorry I always mix concepts, as there is still confusion Sometimes you make mention of putting power in foot, is this as in catching the opponents power in the foot as opposed to the way our body normally catches and deals with force, which starts in the upper body and core. As we become more skilled (cleaner transfer) we want to still have core strength, but make it very still and power and manipulate force on the outer ends (hands and feet) while not affecting our core? My other confusion revolves around this change in the body and the technique/concept. It’s ok to have both regular body activity as long as we can switch to and understand the concept Tai Chi technique at will. How do the traditional focal points like the Dantien etc play into this? I know that a lot of Tai Chi camps place a lot of attention on these points, was this a method of maintaining the bodies natural ability to transfer force/energy while going through such rigorous training that revolved around changing how we process force? Am I way off mark here? That’s quite a few questions, Blake. Let me give a brief answer first. 1. You are starting to understand the concept of “static energy”. I am not going to go through what you described here. The point is, we need to build a stable structure out of our body. That requires actions that are different from what we are used to. 2. This structure is stable but must be moved so that it can be used to fight our opponent. You can see from my Yilu above that the upper body is essentially stable and upright. The lower body parts such as foot, knees, legs, etc. caused the upper body structure to move.